Breastfeeding, gross motor development and obesity, is there any causal association? Lactancia materna, desarrollo motor y obesidad, ¿Existe asociación causal? Childhood obesity is the main nutritional and public health problem in Chile, being the principal causes, the increase in energy dense foods and the decline of physical activity. Interventions to prevent obesity at infancy are focused mainly in improving quality and quantity of dietary intake, without taking into account physical activity, which is expressed under two years of age, mainly by motor development. Some studies have proven that motor development at early age, may influence the ability to perform physical activity. Thus, infants scoring a lower motor development may have a greater risk of becoming obese. It isn’t know if childhood obesity causes lower motor development (given that children may have greater difficulty to move), or on the contrary, it is the lower ability to move, which increases the obesity risk. The objective of this manuscriptis analize the evidence regards the relation between breastfeeding, motor development and obesity in the childhood.To be able to understand this asocation and casual mecanism, it is important to develop stategys focused in early infancy to promote breastfeeding, healthy eating and early stimulation, starting in pediatric office. Obesity is one of the most common public health problems in Chile and in the world, caused by the bad dietary habits and the increase in sedentary lifestyle1. It has been proven that the prevalence of overweight and obesity starts and increases since an early age2. The rapid weight gain between 3 and 6 months of age seems to be a powerful predictor of overweight and subsequent metabolic risk3, therefore children who have a higher body mass index (BMI) in their first months of life have a greater risk of being overweight at 7 years4, also in a long-term, they have higher risk to be obese in adulthood5,6. There are several factors that may modulate an infant’s risk of being obese at a later stage7. It should be considered, among other things, genetic and environmental variables, such as breastfeeding (BF) and complementary food, diseases, physical activity, socio-cultural level, stimulation at home and even their personality and mood8. Lately, during the last 10 years, obesity in schoolchildren has increased in a 30% in our country, reaching 24.2% in children who start the primary school9. On the other hand, we must consider that there is a low prevalence of exclusive BF, which it reaches a 44.5% at the sixth month of life10, in addition to the poor consumption of healthy foods11. Regarding physical activity, the last National Survey of Physical Activity and Sports Habits showed that an 80% of the adult population is sedentary12, and according to data from the Ministry of Education, more than 90% of children during primary school have a poor physical condition13, while preschoolers spend 60% of their time on passive activities14. Recent papers shows that obese children have less motor development, which may be linked to their physical competence in their future15. From this, it is important to highlight that the 14.4% of the children attended in the private health system and 30.4% of children attended in the private system have developmental delay16, predominating gross motor difficulties on the infant group17. The purpose of this study is to analyze the evidence that may associate BF with motor development and obesity in childhood, in order to contribute to develop prevention strategies from an early age. Eating rutine is recognized as one of the most important conditions that leads to excess adiposity in children18, especially during their first year of life. Both, the exclusive BF and sufficient complementary feeding (in quality and quantity) are some factors that promote adequate growth and physical composition19. Although there is not a substantial effect, BF has been shown to be a factor which protects the child from obesity in the long term20,21, with a dose-response effect according to its duration22. Regarding prolonged BF, it is directly associated with a lower percentage of body fat in adulthood due to its effect on growth and body adiposity in infancy23. Gale C et al., in a meta-analysis about physical composition and types of feeding in infants, found that those children fed with BF had lower fat mass at 12 months, compared to those fed with formula, or complementary feeding24. Dewey K. reported that BF-infants tend to be slimmer than Formula feed infants (who were fed with complementary feeding during their second stage of childhood), all this due to their self-regulation of appetite and energy intake25. Complementary feeding with formula and the introduction of solid foods before four months of age increases the risk of children becoming obese by age three26. Some studies state that early feeding experiences are associated with accepting or rejecting different flavors of foods, such as fruits and vegetables. Accordingly, BF would ease the process of acceptance of such foods, as well as the introduction of new solid foods, as long as they have been regularly consumed by the mother. The regular and repeated exposure to a variety of flavors and colors would increase their consumption and acceptance, being the latter precisely the strongest determinant27,28. Cohort studies have proved that there is a connection between increased intake of fruits and vegetables in children and adolescents in relation to a longer duration of BF29. Although there is no established cause, there are studies that prove a linear “dose-response” association between the length of BF period and cognitive and psychomotor development30. This relationship does not depent on the general characteristics of the child or their parents31-33. Grace et al., in a cohort of 2,868 Australian children, showed that the relationship between BF and psychomotor skills remained at 10, 14 and 17 years of follow-up34. However, Tozzi et al. in a cohort of 1,403 healthy children between 10 to 12 years old, reported that the effect of duration of BF on neurocognitive development had any clinical relevance, being mainly dependent on parental education35. Some of the explanations for these associations may be the amount of essential polyunsaturated fatty acids (PUFA) in breast milk36, as well as the warning level that mothers might have in order to detect any psychomotor problem of their children and a greater orentation and stimulous to the development of the infant37. Physical activity and sports provide several health benefits. Physical condition in childhood and adolescence is vital for their present and future health, with an inverse relationship between physical activity, central adiposity and cardiovascular risks38. It seems to be known that motor domain in childhood is inversely associated with the sedentary lifestyle39 and the improvement of aerobic capacity in adolescents40, so it could be a protection for obesity, indirectly. In a finish cohort, Ridgway et al. described that early developmental achievements, such as walking or standing without support, were important predictors of sports participation at around 14 years old, as well as increasing their muscle strength and aerobic capacity during adulthood41,42. Barnett et al. showed in a systematic review that in children from 3 to 18 years old, that the correlation between development and physical capacity depends on which is the development dimension evaluated, finding that there is a positive correlation with coordination, without being able to determine the association with other gross motor skills43. Regarding motor development and obesity, the evidence is even less obvious, and it is difficult to establish that there is a causal relationship. Currently, it is accepted to think that an infant is overweighted because they move less and have worse physical condition in the long term, or that those who later acquire motor skills, such as independent walking, would tend to a higher BMI. 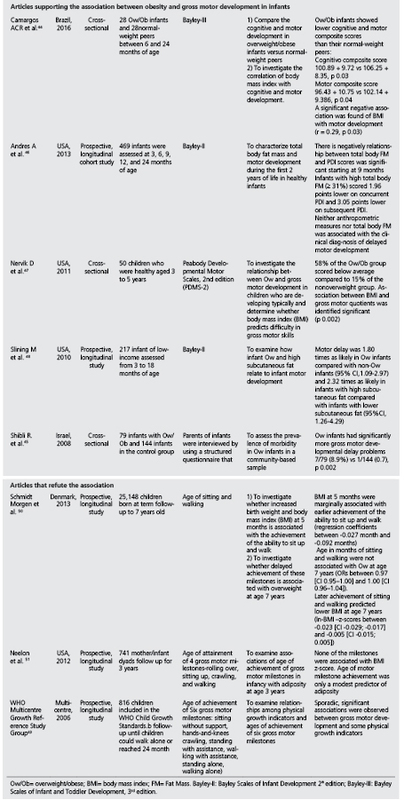 Table 1 summarizes the articles that analyze the relationship between motor skills development and obesity. You would be able to observe great heterogeneity between the methodologies and ages evaluated. There are some studies which conclude that overweight and obese children have lower cognitive and motor skills development. These conclusions are due to the use standardized tests, measuring development coefficients44-48, while others studies that question this association are based on the age of acquisition of some gross motor skills, related to the acquisition of independent gait49-51. Other authors have studied the relationship among anthropometry, motor skills and physical activity in preschoolers and schoolchildren. When comparing children with high BMI versus eutrophic, Nervik D et al. reported that the former have more difficulties in their gross motor skills at the age of 3 and 5 years old47, and according to D’Hondt E et al., they would have lower motor coordination skills between 6 and 10 years of age52. Cheng and Cols, in a cohort of 668 healthy children in the city of Santiago de Chile, investigated the temporal relationship between the acquisition of gross motor skills and the anthropometric evolution. These authors reported that the highest BMI at 5 years of age was associated with lower motor proficiency between the ages of 5 and 10 years old; however, lower motor skills at 5 years were not related to a higher BMI, which suggests that obesity is a predictor of lower physical capacity, but not vice versa53. Childhood obesity and sedentary lifestyle are very important problems in the public health system in our country. Although the scheme is not yet clear, there are several studies supporting the hypothesis that BF protects against obesity and, at the same time, promotes children’s complete development, with a “dose-response” relationship. Considering that the development of motor skills is one of the many items conditioning sports participation in the future (with the obesity’s long-term protective effect), to promote the evolution of children is a responsibility that goes beyond fulfilling what is considered ‘Normal’ (Figure 1). It seems that evidence is increasingly inclined to support a kind of relationship between early motor skills’ development and physical composition, even though it is not complete, probably due to the wide heterogeneity of available studies and the lack of longer-term prospective investigations (Table 1). Figure 1. 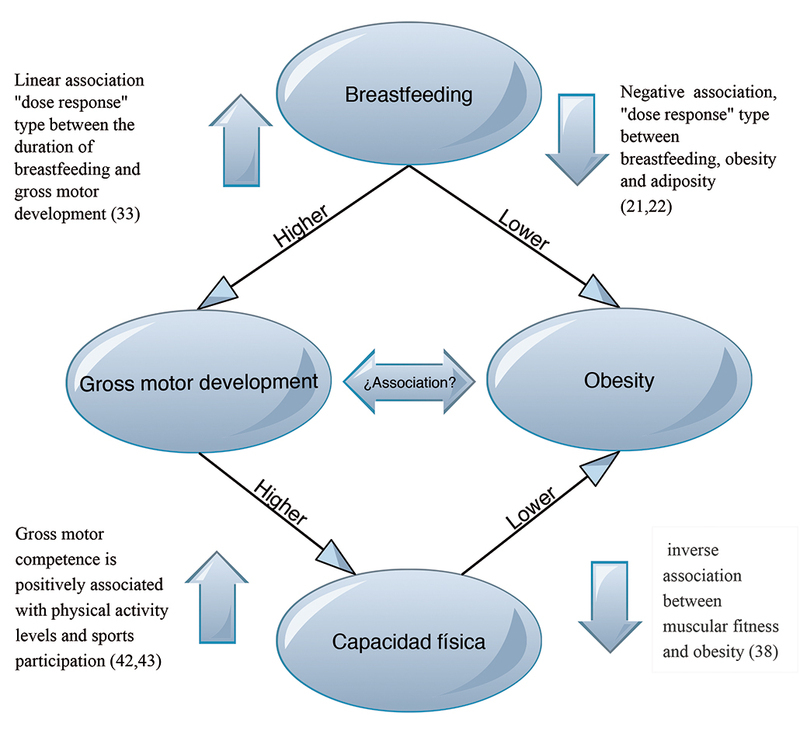 Relationship between breastfeeding, motor development, physical activity and obesity. Regarding the treatment of childhood obesity, results remain very poor. Additional efforts are needed to fight agaisnt this epidemic of the 21st century. In order to prevent overweight , main precautions should be initiated at an early stage54, from the earliest pediatric health supervision activities, reinforcing healthy habits, not only related to food, but also in physical activity and motor skills development.